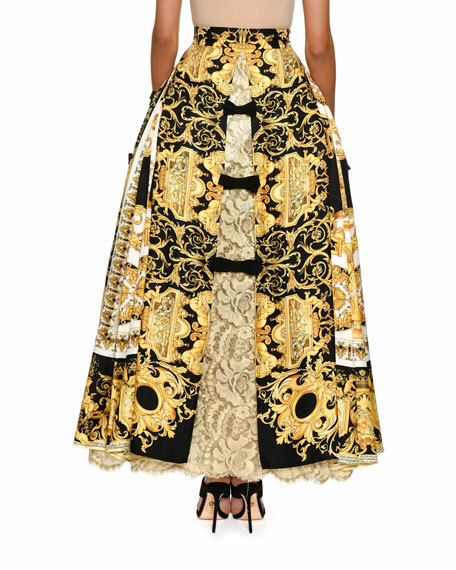 Versace ball skirt baroque-print skirt with lace inset. Versace abstract-print silk skirt. High-waist style. Tulip silhouette. Hidden side zip. Mini length. Lining, acetate/silk. Made in Italy. Versace jersey skirt. Sits high on waist. Pencil silhouette. Full back zip. Knee-length. Viscose/nylon/spandex. Lining, viscose/cupro. Made in Italy. 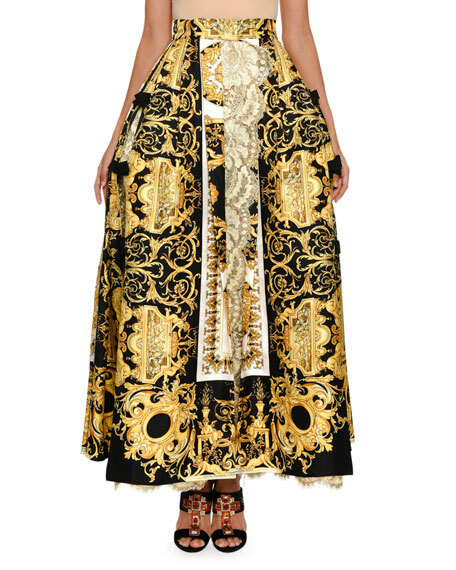 Versace mixed fabric dress with shirt top. Split skirt with accordion-pleated barocco-print left and striped right. Two-tone logo detail at chest. Crew neckline. Short sleeves. A-line silhouette. Cotton. Made in Italy. Versace pleated skirt with signature-print. High-waist. Side slit. Hidden side zip. Short length. Silk self and combo. Dry clean. Made in Italy.